CNBLUE‘s Yonghwa, who is receiving attention as a songwriter these days, unveiled his new studio! Yonghwa shared on Twitter, “Finally revealing my new studio! kekeke After producing in my small room, it feels so good to have a nice room like thisㅠ keke. See you later on the radio~~,” along with the photo above. 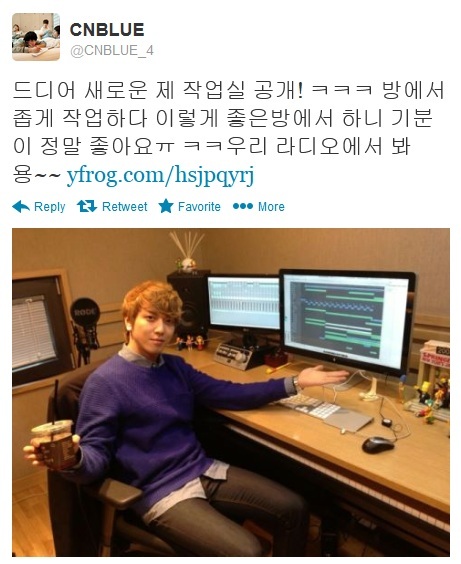 The photo shows Yonghwa proudly showing off his new studio with a coffee in hand, while he works on composing. CNBLUE recently made their chart-topping comeback with “I’m Sorry“, which was composed by Yonghwa himself. Hopefully with this new studio, Yonghwa will continue to make hits.